To bring all the above mentioned functionality into our project we’ll rely on the Spring Cloud Netflix project. 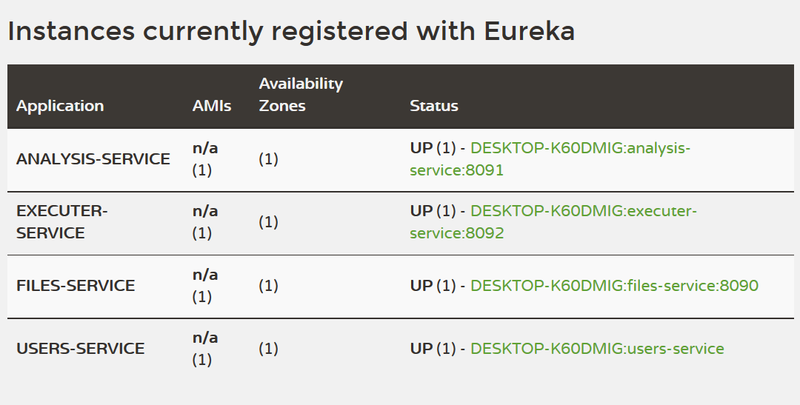 The first part of this project we’ll use is the service registration and discovery tool Eureka. Once we have an Eureka server set up, our services will be able to communicate with it it, to register themselves with it and to obtain URLs for services they need to work with from Eureka. Now you can start your service and navigate to localhost:8761 in your browser to see that you have a running Eureka server. Now we need to refactor our executer service, the one service that communicates with other services in the system. We want our executer service to be able to automatically find and use other services in the system automatically, by looking at what services are registered in Eureka. We will be referring to services by name, from now on, instead of by IP and port. As you can observe, we no longer refer to the analysis service URL as http://localhost:8091, we have replaced it with http://analysis-service, and we have done the same with the file service. If we now run our system and submit a new analysis to the analysis service, we will see that the executer service is able to retrieve and execute the analysis, communicating with the analysis and file service without any problems. And others. It has its own property entries in the YAML file, and in our example we are running without any security, on a different port than our main server and at the /details context path.